This book is designed to help researchers achieve success in funding their National Science Foundation (NSF) research proposals. The book discusses aspects of the proposal submission and review process that are not typically communicated to the research community. Written by authors with successful track records in grant writing and years of experience as NSF Program Directors, this book provides an insider’s view of successful grantsmanship. 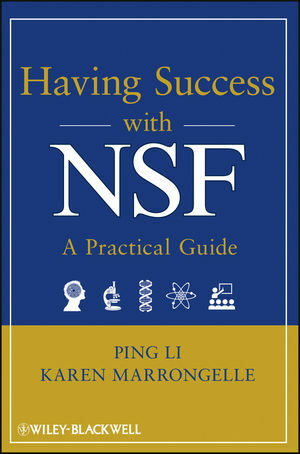 Written in a practical approach, this book offers tips that will not be found in official paperwork and provides answers to questions frequently asked of NSF Program Directors. The purpose of the book is to improve your NSF grant-writing skills and improve your chances of funding. Ping Li is Professor of Psychology, Linguistics, and Information Sciences and Technology, Co-Chair of the Neuroscience Graduate Program, and Co-Director of the Center for Brain, Behavior, and Cognition at Pennsylvania State University. His books include The Acquisition of Lexical and Grammatical Aspect (co-authored with Yasuhiro Shirai, 2000, Mouton de Gruyter), The Handbook of East Asian Psycholinguistics (three volumes co-edited with colleagues, 2006, Cambridge University Press), The Expression of Time (co-edited with W. Klein, 2009, Mouton de Gruyter), and The Psycholinguistics of Bilingualism (co-authored with François Grosjean and other guest contributors, 2012, Wiley). He is Editor of the journal Bilingualism: Language and Cognition, Associate Editor of Frontiers in Language Science, and President of the Society for Computers in Psychology. He has served as Program Director for the Cognitive Neuroscience Program and the Program in Perception, Action, and Cognition at the National Science Foundation, as well as principal investigator, co-investigator, or consultant for many projects funded by the NSF. Karen Marrongelle is Assistant Vice Chancellor for Academic Standards and Collaborations at the Oregon University System and Professor in the Fariborz Maseeh Department of Mathematics & Statistics at Portland State University. She has published numerous articles and reports in the area of undergraduate mathematics education research and mathematics professional development. She has served as Program Director in the Division of Research on Learning in Formal and Informal Settings at the National Science Foundation, as well as a principal investigator, co-investigator, or consultant for many projects funded by the NSF.